The final opening round group sees an intriguing quartet. Colombia, Poland, Senegal and Japan should provide plenty of exciting fixtures with the likes of James and Lewandowsk featuring. Hawkeye Sidekick previews the group and it looks like a battle for second place with Colombia the standout team in this group. A potent dark horse in this tournament. Colombia’s attacking threats will seriously test any opposition in this competition. James, Falcao, Bacca bring different facets to the team. James will look to play deep and make astute runs in behind defenses. Falcao will be the ultimate goal poacher while Bacca’s aerial and shooting prowess is excellent. This is a solid squad selection, defensively compact with Ospina in the sticks providing reassurance if defensive lapses take place. Sanchez and Arias are key personnel in the ranks, their ability to defensively organize and lead by example will be to the fore. Cuadrado as well is a player who given the opportunity could revel in this tournament given the attention that Falcao, Bacca and James will get in this tournament. No significant weak links this side. A side who will be defensively compact but have an edge upfront. Colombia look destined to top the group. Their clash against Poland will be fascinating encounter to see how good this side is. James looks destined to have another immense tournament for Colombia. A difficult side to work out truth be told. Poland are very Jekyll and Hyde at times; their qualification campaign saw mostly consistently high level of performance but then produced an absolute stinker against Denmark in Copenhagen. The side’s chances in this tournament rest with a couple of keynote players. Robert Lewandowski is the talisman of the side. His goal scoring ability is excellent. Fifty-five goals in ninety-five internationals speaks volumes. He will require service from the likes of Grosicki who is an underrated player in the setup. Kubar will look to provide leadership when the opportunities arise. Szczesny and Gilk will need to provide leadership at the back. The issue with Poland is the sheer inconsistency of the side. You will see Poland have excellent periods in games but then there will be poor periods of play which will allow opponents a foothold back into the match. 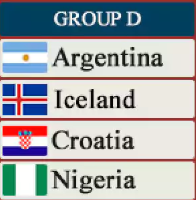 They should advance from the group but not sure if they will advance any further. Disciplinary issues and squad depth could rear their head in the latter stages of this group. Is this the tournament where Japan can cause an upset and advance to the knock out rounds? Sufficient attacking threat to chose from with the likes of Kagawa, Okazaki in the squad. Yoshida and Kawashima are excellent professionals at Southampton and Metz respectively. Japan will provide work rate, desire, team work and organization but how defensively solid are Japan on the set piece? Poland and Colombia in particular are particularly dangerous in this facet of play and some of the goals conceded in their qualification campaign exposed basic defensive fundamentals in free kick situations. I would love for Japan to advance. Their fan base are incredible. For Japan to advance, a lot of things need to go in their favor. Japan will at times control possession in games, they will need to make these periods of play count. I think Colombia and Poland may have just too much for the Japanese team but their work rate and fitness will keep teams honest in this group. Opening round exit looks the shrewd bet here. A side who have experience and talent to cause problems for the other teams in the group. The experience of the squad emphasized with the likes of Kouyate, Gueye, Mane, Biram Diouf, Sakho. Players who have a wealth of EPL experience. Mane is the key player for this Senegal outfit. The African nation will look to hit opposition on the counter attack and Mane’s pace and prowess in front of goal will be the primary threat for the side. The negative is defensive frailties during the friendly games in recent weeks; defensive organization on the set piece was problematic and issues at times with their shape. Training camp sessions hopefully addressed these concerns. 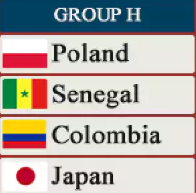 The outcome of their first group game against Poland will determine how far Senegal will advance in this competition. A positive result and the team will fancy their chances of group progression; otherwise, heads will go down and an early exit could be confirmed in their second fixture. 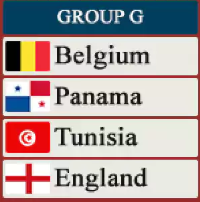 Group G sees England and Belgiium pitted against Tunisia and Panama. Can a youthful England side with little pressure deliver good performances in this group? Can Belgium’s golden generation produce the results and progression that the squad depth in their ranks deserves? Hawkeye Sidekick previews the group setup. This is an ideal group for Belgium to settle into this tournament, looking to rid the ring rust and gain confidence heading into the second round of the competition. The squad depth is stacked with talent. The spine of the team looks strong with Courtois, Kompany, Vertonghen, Dembele, Hazard, De Bruyne and Lukaku to name but a few and a squad depth whose performance levels are high. The question for me about Belgium is how versatile and adaptable the team is given the game time circumstance. Recent tournaments have seen Belgium resort to Plan A with little deviation from that plan. Given their manager Roberto Martinez was critiqued for the same failing in club football, it will be interesting to see if Belgium can adapt as in the knock out rounds, they will be asked to change their game plan. If they can, then this is a serious contender. 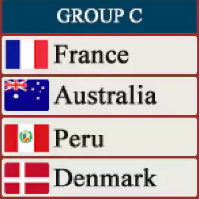 Their final group game against England will determine who tops the group. Given their experience and caliber in the ranks, Belgium should qualify with ease to the second round and win the group but as mentioned the ability to change tact during the knockout rounds to achieve a result is their real test. The hype about England has reduced considerably for this tournament. The side is a work in progress with question marks on defense and goalkeeping key. The goalkeeping position is up for grabs. Pickford, Butland or Pope have precious little experience at this level, not sure who will be lining up in goal for the Tunisian game? Enough said and the fact that Pickford and Butland have a mistake in them does not inspire sufficient confidence either. The defensive side of the game has the potential to be on point. Walker, Rose and Trippier on the full back flanks will provide midfield sufficient width and their ability to defend is on point. The key question is the central defensive position and who fills the position? Will England go three at the back? Cahill or Stones need to be dominant, huge ask given their lack of first team action with their clubs this season. Question marks defensively for me. The midfield and attacking options look exciting. Kane will score goals provided that the service from out wide is on point. Can Dele Ali start this tournament with energy and positive attacking mindset? His partnership with Kane looks key to England’s success from an attacking sense. England should be more than capable to advance from this group but I think lapses defensively and goalkeeping are not far away. England to advance as runners up in the group with a couple of scares. For England to be a dark horse, Sterling has to deliver. Time will tell. Their opening fixture against England is their proverbial cup final. They need to get something from this tie to realistically have a chance of qualifying for the second round. Tunisian’s squad looks solid and compact with the majority of players plying their trade in France, Egypt, Saudia Arabia and in Tunisia. Massive onus in this side will fall to Leicester City’s Yohan Benalouane who will need to marshal his team mates around him from central defensive to ensure that the side is compact, hard to breakdown and organized because the attacking options while pacy have no proven goal scoring threat in this level of competition. Khazri is the focal point in attack; needs good service but given possession issues against England and Belgium, it could be a forlorn experience. What is the hope for Tunisia? The hope and expectation is to be competitive and look to be in these group games come the final twenty minutes and look to score on the counter-attack or set-piece. The lack of goal threat is an impediment, the goal ratio in the squad is low. Tunisia to offer plenty but an opening round exit looks on the cards provided they can turn the tables on England tomorrow! The fairy tale of making the World Cup for Panama is here. It is now time to deliver and produce good performances. The squad is comprised of players plying their trade in MLS and Central America. This is a significant improvement in opposition and I fear for Panama in all facets of play. Their opening fixture against Belgium could be a potential nightmare unless Panama are defensively solid. Belgium have the ability to carve this side open at various stages; it is up to Panama to be compact and perhaps park the bus for the opening period and then look to probe Belgium thereafter with Perez and Tejada the key attacking threat. Tournaments like this at times have glorious fairy tale stories but for Panama, the fairy tale ends here. Penedo and Baloy will have to produce heroics defensively for Panama to have any chance of securing a result in this group. Panama look vulnerable and an opening round exit is on the cards. Group F. A group which features Germany, the reigning World Cup Champions and one of the teams tipped to win the competition next month. Mexico, Sweden and Korea Republic will look to upset the odds but realistically it is a straight fight for the second place in the group. Hawkeye Sidekick previews the action. Joachim Low had the luxury of not selecting Leroy Sane from the final squad, enough said. Germany are laden with talent in all positions and the squad depth is strong in all positions. The positives for Germany is their squad’s backbone is personnel who triumphed in this competition four years ago. Kroos, Ozil, Reus, Khedira, Hummels, Boateng, Neuer all feature in this squad. Experience aplenty in the squad and their knowledge and insight in how to win this competition is invaluable. Plenty of attacking options for Low to chose from. Gomez, Werner and Reus bring something different to the table. Gomez with his aerial threat. Werner with his movement. Reus with his pace and ability to create space in the box. Throw in Muller who can play in the nine channel and options are there for German management. The negatives are potentially two fold: Is Manuel Neuer fully fit? If so, does Neuer have sufficient game minutes under his belt to perform at his typical ultra high levels. Low needs to make a hard call on Neuer if either question is no with ter Stegen in the wings to fill in. Sane’s omission was a surprise. His pace, movement and ability to score goals was to the fore with Manchester City. Low and management evaluated in international football conditions and felt it was not the time for the youngster. Draxler, Brandt and Rudy are ahead of Sane in the depth chart, it is a decision if Germany do not win the competition will be discussed over and over again. Germany will have sufficient quality to win this group with a bit to spare. Their group will not fully test the side’s full capabilities until the knock out rounds. 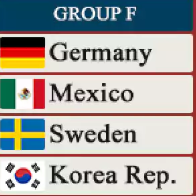 Mexico realistically are hunting for the second place in this group along with Sweden and South Korea. Few surprises in the squad selection. The squad contains several marquee names. Marquez in central defense. Salcedo looking to roam forward from full back. dos Santos looking to link midfield and attack with sharp, incisive passing. Hernandez looking for a chance to score a goal along with Carlos Vela. Guardado and Herrera are key fulcrums for this Mexico side. Guardado at central midfield will look to protect his defense while supporting the likes of Vela with incisive runs from deep. Herrera at center back is a player with huge talent and pace, needs to be focused throughout. The negative for Mexico is perhaps mentality based. What happens when Mexico concede the first goal? Will the team look to respond in a positive fashion or go out with a whimper? Mexico vs. Sweden decides who advances to the second round, hard to separate both teams. A solid team, well organized and with their threat on the set piece will pose problems for all group opponents. The positives for Sweden is their organization, they will sit in when required and this could frustrate particularly Mexico who may throw caution to the wind and let the Swedes score. Their performance against Italy on the road to secure their place in this World Cup a perfect case study. Experience aplenty in the squad. Larsson, Olsson, Jansson, Toivonen, Forsberg have all experienced marquee tournaments and their presence will be a reassuring presence in the camp. Lindelof will have a point to prove with Sweden after a mixed season with Manchester United. The negatives for Sweden is potentially that they struggle to score goals in major tournaments. UEFA European Championships, they exited in the group stages; their performances were extremely one dimensional from an attacking perspective. The onus is on Toivonen and Guidetti to provide the goals upfront; otherwise Sweden will look to score from the set piece. 50/50 call with Mexico on whether they qualify for the second round. The underdog of the group. South Korea need to be organized in their defensive duties but questions abound on the quality of their goalkeeping and back line options to offset the threat of the other three teams in the group. South Korea will look to their players who are plying their football careers in the UK and Germany. Heung-Min is an excellent attacking player and he will need the service from Ja-cheol and Ki Sung-yueng to impress. The rest of the side need to be compact and solid and hope that this is enough to advance. However, with Brazil and tweak tough Serbia and Switzerland for company, an early exit looks on the cards! 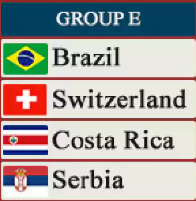 Group E sees Brazil enter the competition in a group containing Serbia, Switzerland and underdog Costa Rica. A group which may see some dull games but a group which should prove whether Brazil have the squad depth, defensive and attacking qualities to be considered a leading World Cup contender. Tite has named an extremely strong squad for this tournament. Alisson, Ederson are quality keeper options for a defense which will be led and marshaled by the likes of Thiago Silva, Marcelo and Danilo. The midfield squad options are endless. Paulinho has had a superb debut season with Barcelona. Fred and Willian have featured well in UEFA Champions League and also have defensive solidity with the inclusions of Fernandinho and Casemiro. Coutinho has the ability to provide superb cameos for his striking options as well. Brazil hopes will depend on how fit is Neymar; the superstar has not featured in months for PSG and he needs to be on top form for Brazil to win this tournament. Yes, Brazil do have Firmino, Jesus and Costa but Neymar on form makes this Brazil into a completely different animal. Brazil if Neymar is fully fit could be rampant in these group phase games. Minimal negatives except for perhaps quality depth in the defensive positions if suspensions come into play in the knockout rounds. The central defensive options look limited; plenty of full back options and something to monitor as the tournament progresses. Brazil have more than enough to top this group; their composure and patience will be tested by Serbia and Switzerland who are defensively well organized. The Swiss are a difficult side to analyze; undoubted footballing ability and when you see this side in qualification for major tournaments, they look the absolute part, they play attractive football but then when it comes to the marquee tournament, they park the bus, go ultra conservative and you cannot wait for the side to be out of the tournament. The positives for Switzerland is their squad profile; many players with vast international experience. They have in Xherdan Shaqiri a player who has the ability and potential to win games with moments of sheer brilliance. Johan Djourou, Stephan Lichtsteiner, Granit Xhaka, Valon Behrami will need to provide the leadership and supply to Shaqiri for the side to be successful. The issue I see with Switzerland is their lack of a potent front man. Seferovic is their key striker along with Shaqiri will form the goal scoring threat. The habit of turning to prototype conservative for the Swiss is also not far away as well. If they go down that route, hope that they are knocked out of the tournament early. It is no fun to watch a Switzerland under those conditions! An enigma. This side if the squad and management are at one will be very competitive. Serbia will look to play on the counter attack in the key fixtures of this pool, bad news for anyone paid into watch themselves and Switzerland! In Dusan Tadic, they have a player whose pace in the counter attack could create massive issues for group opposition. The positives for the side is that the spine of the side is rock solid. Stojkovic, Ivanovic, Matic will provide defensive assurance to those around them. Kolarov has had a superb season with AS Roma and his delivery from the full back position is still on point. A team who will be defensively disciplined and will revel in the Russian summer. The negative for the side is potentially their striker options. Aleksandar Mitrovic on top form with Serbia is a goal poacher supreme but if anyone has watched EPL can testify, the player does lose the plot from time to time. Can Serbia find an alternate striker perhaps in Prijovic to have a breakout tournament. Expect Serbia to go 4-5-1 formation potentially with Tadic roving behind Mitrovic; marginally going for the Eastern Europeans to advance but the second round may be their lot. I love Costa Rica, a fabulous country, great people and great culture but I think this World Cup may be a chastening experience for the nation. Navas in the Costa Rica goal will have to play out of his skin to prevent his side from going down to a couple of heavy losses. I am seeing nothing in the outfield options to inspire confidence. Gamboa, Ruiz, Oviedo and Campbell are the standout talents in this squad but this looks a daunting challenge. A team who will struggle to score goals and struggle to keep clean sheets, hopefully Costa Rica are competitive and force a result but I am not optimistic for their chances. An early exit beckons.